In the weeks since the devastating earthquake in Haiti, familiar patterns of interference and neglect by the major powers that dominate the country are firmly entrenched. Notwithstanding heroic efforts of ordinary Haitian people, Haitian government officials and agencies and many international organizations, a grave health risk hovers over the people who are residing in the earthquake zone or who have fled beyond it. Meanwhile, the direction of Haiti’s reconstruction remains entirely undetermined. The study looks at natural disasters over the past 40 years and concludes that the death toll, per capita, of Haiti’s earthquake is four times or more higher than any other disaster in this time period. Nearly 24,000 people per million of Haiti’s population died. The total estimated death toll is well over 200,000. The closest equivalent is 4,000 per million in the 1972 earthquake that struck Nicaragua. The Partners In Health agency estimates some 1.3 million people were left without shelter by the earthquake. The majority of those people still do not have adequate emergency shelter nor access to potable water, food and medical attention. According to U.S. AID, there are approximately 600,000 displaced people living in 416 makeshift camps in Port-au-Prince. Sanitation conditions in the camps remain a grave concern. With heavy seasonal rains fast approaching, the population is extremely vulnerable to exposure and water-borne disease. The U.S. Centers for Disease Control and Prevention issued an alert on March 4 about another deadly danger that lurks: malaria. It said, “Displaced persons living outdoors or in temporary shelters and thousands of emergency responders in Haiti are at substantial risk for malaria.” Each year, Haiti has 30,000 confirmed cases of malaria. Officials believe the actual number is closer to 200,000. Partners In Health says it has established clinics in five of the makeshift settlements in Port au Prince, serving some 80,000 to 100,000 people. Under pressure from international agencies, the Haitian government has pulled back on its appeal for tent camps to be established to meet the displaced population’s needs. Since January, U.S. AID and some U.N. agencies have refused such calls, instead arguing for a policy that U.S. AID calls, “Thinking Outside the Tent.” Victims are directed to return to their shattered neighborhoods and fend for themselves, albeit with promises of provision of building materials such as corrugated iron sheets for protection from the rains. But those who have congregated into makeshift camps are there precisely because provision of aid to neighborhoods has proven insufficient or entirely lacking. That’s the story of the Morne Lazarre neighbourhood in Petionville, a district on the outskirts of Port-au-Prince. There, the community school SOPUDEP has played a heroic role in organizing medical treatment and food and water supplies to the local population and even to other affected areas. School Director Réa Dol’s efforts are featured in a recent video documentary produced by the New York Times. Conditions are also critical outside the earthquake zone. Cap Haitien, Haiti’s second largest city located 120 km north of Port au Prince, has received an estimated influx of 50,000 refugees. Its mayor, Michel St. Croix, recently told the Miami Herald, “We need housing, sanitation, security — we need everything.” He said the city has received next to no assistance from the United Nations nor the International Red Cross. “Of the aid money coming into Haiti, the Haitian government is seeing a very small amount – about $1 of every $100. 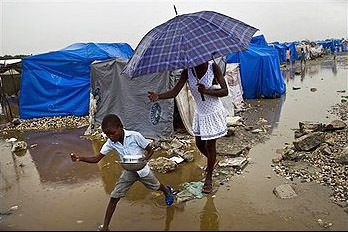 Constan spoke of the “sad fact” that the Haitian Ministry of Health does not even have vehicles in which to move around. Préval says the direction of international aid is becoming a barrier to the creation of government institutions and of economic activity that could gradually supply more and more of the country’s needs. Every foreign government in Haiti pays lip service to the principle of strengthening the capacities of the Haitian government, its ministries and agencies. But most have failed that test. In a speech to a conference of GlobeMed in Chicago on March 5, PIH founder Paul Farmer said a recent study of financial promises made to Haiti at a U.N. donors conference in April 2009 showed that of the more than $400 million in aid promised, only 15 percent was delivered by the time of the earthquake. Farmer warned against the “trauma vultures” descending on Haiti. He asked why so many years of aid and charitable funds going to Haiti has left the country poorer than ever. The record of international donors will again be put to the test when a U.N.-organized donors conference convenes in New York City on March 31. If some relief agencies are voicing concern about the relief effort, it’s being largely ignored in Canada. Haiti’s desperate plight has fallen off the radar of Canada’s media. Canada was one of the few large countries in the world that did not send civilian emergency rescue teams to Haiti. Its official aid mission arrived one week after the earthquake in the form of two warships and 2,000 military personnel. They pitched into the relief effort and earned praise for their work. But most of the assistance brought by the military, including its field hospital in Léogâne and its emergency health center in Jacmel, have now been withdrawn. A report in the Halifax Chronicle Herald the following day refuted Harper’s claim. HMCS Halifax and HMCS Athabasca, in fact, carried precious little supplies beyond the needs of their crew and the additional military personnel they carried. And herein lies a clue to the thinking and planning of Canadian political and military leaders. Like their U.S. counterparts, the first response of Canada’s leaders was concern and preoccupation that the earthquake disaster would open space for the Haitian people to retake some of the sovereign political ground lost following the overthrow of their elected government in 2004. The first actions of all the foreign militaries dispatched to Haiti was to flood the earthquake zone with heavily armed patrols and to otherwise ensure the “security” of the respective cities where they were assigned. The U.S. demanded and received complete control over the national airport in Port au Prince. Speaking on a panel that included Professor Jon Beasley-Murray of the University of British Columbia and Larry Keuhn of the BC Teachers Federation, writer and author Federico Fuentes from Venezuela detailed that country’s response to the crisis. It landed teams of aid and medical workers within hours of the earthquake and quickly assisted in erecting shelter. It has cancelled Haiti’s outstanding debt to Venezuela and is providing free fuel during the reconstruction process. Prior to the earthquake, Cuba had some 350 health professionals volunteering in Haiti. That number, including graduates and students from the Latin American Medical School (ELAM) in Cuba, has expanded considerably. Since 2005, 550 Haitian doctors have graduated from ELAM. The school received its first Haitian students in 1999. Currently, there are 570 students from Haiti attending the school. Roger Annis, a coordinator of the Canada Haiti Action Network and its Vancouver affiliate, Haiti Solidarity BC, can be reached through Stuart Hammond at haitisolidaritybc@resist.ca. Annis writes: “An important source of news and analysis on Haiti is the new website Haiti Relief and Reconstruction Watch. Much information in this article was obtained from sources it cited. Timely and informative articles and videos are also posted to the website of the Canada Haiti Action Network and the Institute for Justice and Democracy in Haiti.” A sister organization in the U.S. is the Haiti Action Committee at www.haitiaction.net and www.haitisolidarity.net. Next articleRed Cross under fire! Where’s the money for Haiti?